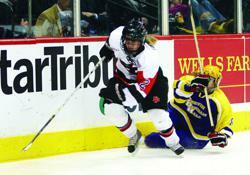 Bethany Brausen is one of many top talents who have come out of the Roseville Area High School program where she notched 56 points as a senior en route to the 2010 Ms. Hockey Award. She con-tinued her hockey career at the Univer-sity of Minnesota where she served two years as team captain and was part of a pair of national championship teams in 2012 and 2013. Today, Brausen still dons the maroon and gold as an assistant coach for the Golden Gophers. After an illustrious career at Eden Prai-rie High School where she helped lead the Eagles to a 2006 state title and was named a Ms. Hockey finalist, Meghan Pezon attended St. Cloud State Universi-ty where she recorded 41 goals and 54 assists during her four-year career. But her career didn’t end there. Pezon is cur-rently a member of the Minnesota White-caps of the NWHL and is ranked No. 24 on our list of the top 25 girls’ hockey players of the past 25 years. She also serves as an assistant coach at St. Catherine’s University. Kelly Seeler is a two-time state champion-ship member of the Eden Prairie Eagles, having helped lead her team to titles in 2006 and 2008. 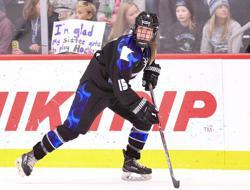 After her high school career, which included being named a finalist for Ms. Hockey, Seeler went on to star for the University of Minnesota Golden Gophers, helping lead them to a title in 2012. A steady bluelin-er who could also score, she finished her career ranked ninth among Gopher defensemen in points. 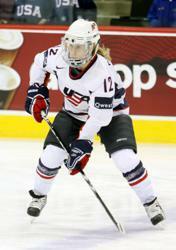 Jenny Potter is one of the most decorated hockey players to come out of the State of Hockey. Not only was she a standout at Edina High School, she went on to become a star at both the Univer-sity of Minnesota Duluth and the University of Minnesota, where she once scored six goals in one game. In her four years of collegiate play, she racked up an astounding 327 points. But most of her prowess came from her international play, wearing the Team USA jersey. Potter is the re-cipient of four medals, winning gold in 1998, silver in 2002 and 2010, and bronze in 2006. She also played professionally for the Minnesota White-caps and the Boston Blades and is currently serving as head coach of the Slovakia Women’s National Team. Potter also was head coach at Trinity College for two years and runs a summer hockey camp dubbed Potter’s Pure Hockey. 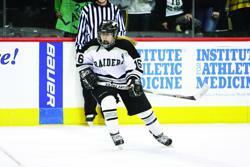 Rachel Ramsey has plenty of hockey running in her blood. Her father, Mike, was a member of the 1980 Olympic Team that shocked the world with their gold-medal win over the Soviet Union. But Rachel has made a name for herself. After leading Minnetonka to 147 wins over her high school career and earning 2011 Ms. Hockey finalist honors, she opted for the Maroon and Gold at the University of Minnesota where she led the Gophers to three national championships. 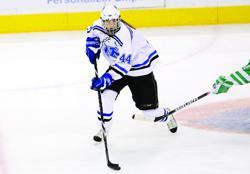 In her four years at the U, Ramsey tallied 130 points, a large total for a defenseman. She also appeared in every game the Gophers played in her four years, 164 in all. Despite offers to play professionally and internationally, Ramsey retired from hockey following her college career and is now a marketing professional.